The Academy of Pedorthic Science is approved by the state of Georgia as a certified Veteran Training Center by the Department of Veterans Service. Once a Certificate of Eligibility has been issued, contact the Military liaison and KSE CCPE registration office at 470-578-3152 or email [email protected]. The Pedorthic Certificate Program is approved through the VA for Educational benefits. Active duty and honorably discharged members of the Army, Navy, Air Force and marines may qualify for military education benefits based upon GI Bill coverage and length of service. To apply for benefits, click on the photo to the right to be taken to the Department of Veteran Affairs website. For telephone assistance call 1-888-GIBILL1. For further information and eligibility requirements, contact the Base Education Officer or Office. The NCOPE standards ensure the quality of Pedorthic education by requiring all accredited programs to be sponsored by a fully accredited college/university institution. 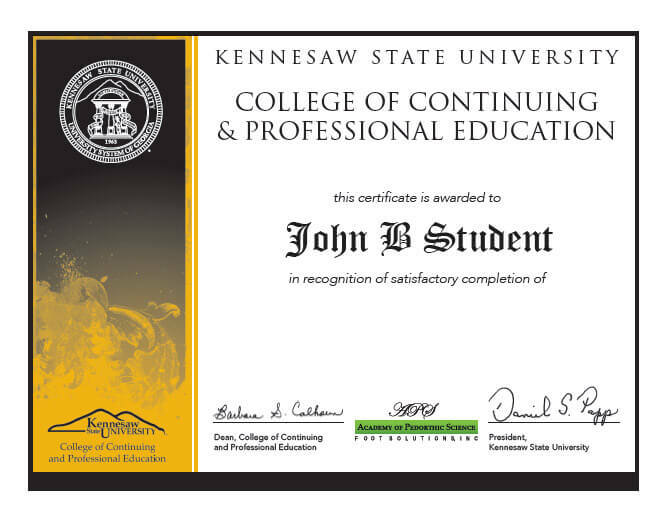 The Academy of Pedorthic Science is proud to have our Pedorthic Certificate Program sponsored by Kennesaw State University College of Continuing and Professional Education. A university level certificate is required to take either the ABC or BOC pedorthic certificate examination. In order to be awarded a program certificate, you must satisfactorily pass the program intermediary tests and quizzes, then pass the final exam with a minimum score of 70%. The tuition for the program is $3,200.00 plus a $500.00 materials fee which covers the cost of all your course materials on a tablet and laboratory materials/supplies. Document 1,000 hours of patient care experience acquired before or after you complete the certificate program. © 2018 Academy of Pedorthic Sciences.